Apple has stopped calling the new iPad "4G-capable" after regulators cracked down on its U.S.-only capability to connect to high-speed LTE networks. Although it is still listed as being "4G LTE capable," the new iPad is now called "Wi-Fi + Cellular" instead of "Wi-Fi + 4G" in the U.S., U.K., Australia, Canada, and several parts of Asia. The new iPad featured 4G LTE connectivity from day one, but the catch is that it was only compatible with the high-speed networks in the U.S., namely AT&T and Verizon. Elsewhere, cellular connectivity was achieved through 3G data networks, including HSPA and HSPA+, which some carriers still labeled as 4G. Apple's labeling drew criticism from regulators in Australia because its advertisements misled regarding the device's 4G connectivity, and Apple also got complaints from customers in Europe. In Australia, Apple had to e-mail customers about the tablet's incompatibility with country’s carrier and offer a refund. In the U.K., the country’s Advertising Standards Authority threatened Apple with a marketing ban because carriers there are still debating over the implementation of 4G LTE. Following the backlash to the new iPad’s 4G claim, it’s no surprise that Apple decided to quietly change the term to "cellular" to appease critics. Now, when you go to Apple’s page to buy an iPad, in the U.S. and several other countries, you won’t see the option to get a "new iPad Wi-Fi + 4G," but "Wi-Fi + Cellular" instead. Outside the U.S. the references to "4G connectivity" in the features description pages have been removed as well. 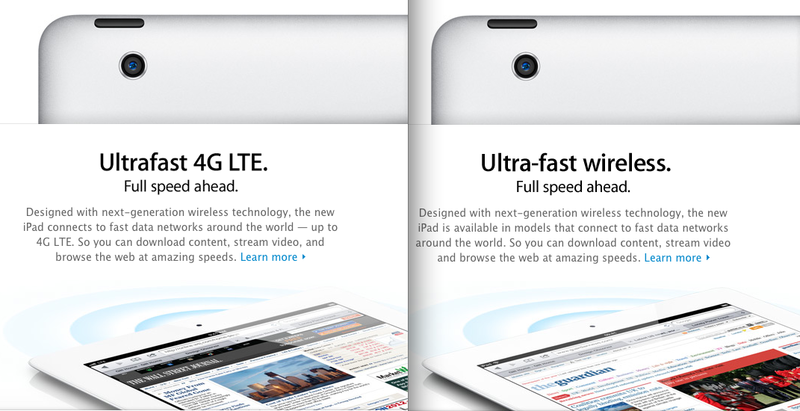 Meanwhile, while Apple preferred the term "cellular" to replace "4G LTE connectivity" outside the U.S., the name of the "iPad 2 Wi-Fi + 3G" remains unchanged. It’s still unclear whether the "4G" will be removed from the packaging of the new iPad as well, but it looks like Apple is making the change across the board now.